You can only laugh at this: Victoria, the 15th largest city in Canada, finds itself on the outside of the new Canadian Monopoly board looking in (Warning: link to the Times Colonist). 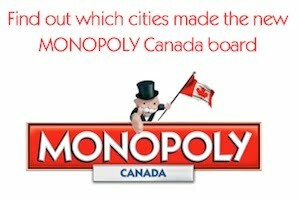 Monopoly has 40 spaces, so that means Victoria is less thought of by Canadians who voted in the Monopoly cities than places like Chilliwack, Kawartha Lakes, Chatham-Kent, Sarnia, Windsor, North Bay, and Beauceville. Now, of course, this wasn't a scientific poll, and one could make the argument that retirees don't participate in online voting for board games they don't play and all that mumbo jumbo; but really, it doesn't matter what arguments you make when you have city councilors like Chris Coleman trumpeting our little piece of God's green Earth in a local rag to reassure Victorians that eating Kraft Dinner five meals per week to pay your mortgage is an enviable way of life. Now don't get me wrong. I do agree with Chris, this is a gorgeous piece of the globe that many of us are very lucky to occupy for our short time on God's green Earth. It's just overpriced because a lot of Victorians have an inferiority complex about themselves and their city that they believe can somehow be cured by ridiculously high home prices. And not of the "fantastic opportunity" says the real estate salesperson kind either. In my usual Sunday evening round-up of all things real estate related on the interwebs I came across this dandy piece of writing in the Globe and Mail. In my mind anyway, it's a must read for everyone watching the market. Listings are up, sales are down, and even the always bullish industry executives are predicting lower prices in the coming year. Oxymoron? Are we potential home buyers stupid? Some REALTORS® marketing their properties as investments might think we are, or maybe the problem is them, not us. I'm seeing more and more listings lately using the terms "investment," "equity" and "why rent?" The market has clearly turned. It's getting tough out there for people trying to make a living in the real estate industry. Sales volumes are down, prices are falling and more people are starting to believe the news when they ask questions and find answers about the Canadian real estate bubble. The Canadian Real Estate Association has stated prices are falling across the country and will be pulled down by overheated markets in the west for the remainder of 2010 and into 2011. TD Economics has agreed, and forecasted greater price depreciation than the CREA. But some local salespeople don't think we get it. They continue to market properties as investments without disclaimers warning potential buyers of market volatility etc. They continue to suggest renting is throwing money away - incredibly, they push the idea that we can build equity in a market experiencing significant price volatility and overall decline. Especially those salespeople trying to sell condos. Does that look like a market you can build equity in? I've been toying around with the idea of swapping blogging content management systems over to Wordpress from Blogger. Seems to me like Wordpress offers so much more flexibility than Blogger. The reason I haven't though is that I understand a switch like that would create issues for readers and commentators who have taken the initiative to set up RSS feeds and commenting accounts. Anyway, Blogger's made a bunch of back-end changes to their system and made it easy for authors to customize their blogs. I'm happy for now. I've noticed there have been a fair number of new commentators lately, which I think we're all very glad for. I wanted to give all of you an easy to follow cheat sheet if you will of commonly used commenting HTML markup so that you can share your thoughts and links a little easier for everyone to interact with. I will stick this post up in the Resource Links section to the right for easy reference. I've also cleaned up the Resource Links section and the Blogroll to fix broken links, get rid of dead ones and removed inactive blogs. It's been a bit of a reminder of how much goes into regular blogging when you remove several blogs that have authors who have moved on to other things. My apologies if I've offended anyone by removing their blog - shoot me an email or leave a comment and I'll promptly re-add it to the list. Please feel free to suggest other helpful links and/or resources too. Regular readers will know that I believe the real estate industry needs a code of ethics that requires salespeople to make an investment disclosure if they choose to market their products as investments. I'd even go so far as to say that real estate related salespeople should not be allowed to utter the word investment in any manner related to the products they sell. But I recognize this has a snowball's chance in hell of happening. It's just become too accepted in today's climate that buying a home is "the best investment you can make;" even when it isn't. Like right now. Aggressively priced at 2010 assessed value of $233,800 to sell quickly! Terrific investment opportunity, with no rental restrictions, this 2 bedroom condo is the best deal in downtown Victoria. This fully remediated building has a new roof (special assessment has been paid), separate storage and bike storage, allows pets and offers secure underground parking for only $60/month. This unit features an open & modern floor plan, large walk-in closet, in-suite laundry, balcony w/ garden views, new paint in 2009, new energy efficient fridge and low flush toilet. All appliances are included. Tenants are currently on a fixed term lease expiring July 31, 2010 paying $1175 per month. This is an outstanding value! Emphasis mine. Whoever listed this property wants to attract someone who may be thinking about tying some money up in a rental property. Hey, with the lack of first time buyers shopping right now, an agent's gotta get creative to find a buyer right? Let's see what "terrific," "aggressively priced" and "outstanding value" means to this agent shall we? Scenario 1: Buyer pays cash and retains current tenants at same rent ($1175 per month/$14,100 per year) and pays $110 and $220 per month in taxes and strata fees (actual) for annualized costs of $3960. So the "income" on the investment is $10,140. Expressed as a percentage, this is 4.3%. I've skipped some costs, and not calculated taxes, but you get the idea. The real take-home ROI is likely to be half of that - which a high interest savings account will easily match and provide infinitely more liquidity. Anyway, this is the best investment scenario I can think of, and this is what this agent likely meant by "terrific." Scenario 2: Buyer isn't really an "investor" but begs, borrows and steals from their primary home equity to scrape out the 20% down required by CMHC for "investment" properties now that April 19 has rolled on past - they do this grumpily cursing that damn CMHC for making it harder for them to get rich too. Let's say they too keep the same tenant and same rent, so their input numbers are the same ($14,100). Output is different though: Strata and taxes are the same ($3960) but then add mortgage payments totaling $12,540 for total output costs of $16,500. I guess outstanding value means a minimum loss per year of $2400. I say minimum because we haven't factored income taxes or opportunity cost on the almost $50,000 down payment into the costs either. Forgive me for this very simplified analysis of "terrific investment opportunity" and "outstanding value" but I wanted to illustrate why residential real estate sales people should be required to make mandatory financial performance disclosures about their "investment products" if they want to act as "investment advisers." But if they want to call themselves speculation specialists, I'll shut my yap. Oh, and if you're still not convinced by my analysis of what a crappy investment buying in this building today would be over the next year or so, perhaps you can ask any one of the 7 or 8 owners who are currently trying to eject themselves out of their ownership situations - one of whom who is listed for less with more rental income coming in, which I guess takes care of "aggressively priced" then eh? We had the luxury misfortune of staying in a new condo for a little while recently. This one was built, let's say early-boom, in 2004 and 2005. It shows: workmanship is arguably better than those constructed in 2007 and 2008, but finishing quality is poor - sure the appliances were stainless, but the counter tops, cabinetry, fixtures and flooring didn't even try to be faux-luxury. That and it's probably 100 square feet bigger than its younger siblings' offerings. The layout made me think the developer designed it himself on the back of a napkin over a cheeseburger at lunch - kids in grade ten shop class probably can do better design work. Not one person I saw coming and going from this place looked a) old enough to be a homeowner and b) professional enough to afford the low-to-mid-$300K price tags this building has been demanding since completion. It got me thinking. This town is in a new paradigm. Readers of HHV, myself included, we prognosticate on what must be going through the minds of homeowners, well, mostly home buyers and home sellers really, almost daily on this blog. But what do we really know? These kids wandering in and out of this building to and from their careers jobs and social lives probably have never experienced real economic hardship in their lifetimes - unless they have the odd distinction of having been born on Black Monday back in 1987, and I'm sure many of the people living in this building are children of that year. OK, so what was I thinking originally? Many of these "kid homeowners" bought the dream: buy a condo, live in it long enough to pick up a partner in a downtown bar or workplace, mess around some and produce an offspring, maybe commit in a civil ceremony or its equivalent, sell the condo and buy a house having made out like a bandit in the process. But that dream isn't so real in a time of falling condo prices. Imagine being an agent, trying to have the pricing conversation with Joe and Pauline, and letting them know that their mistaken belief of a 50% gain over 3 years is more like a lucky-to-break-even-after-selling-and-buying-costs-are-calculated. I don't envy them at all. These early months of a downturn in the real estate market are so new, so completely different than expectations for many home sellers, they must be in complete denial. Especially the ones who have never been through anything like this before. "Prices will rebound next spring. We'll just wait and list then." Denial. Stage one. I wonder if Strata Councils will create price-bust support groups? You know they're sh&tting over in the CREA headquarters when after one month of declining sales volume they soften their yearly projections. This isn't like 2008 over again, it's something new, it's happening fast and that panicked feeling in the head office is flowing out into the streets. If you're out shopping for a home in Victoria right now and you pull the trigger you must be one of the most impatient persons around. It's literally like watching the shop keeper put out the "on sale" sign but rushing to get to the till before he's had a chance to lower the price.